When I made Apple Butter last month it smelled amazing! I made bread a few days later and while the bread was baking I could smell the Apple Butter again. The apple butter smell mixed with the bread smell was amazing. It made me think of apple cinnamon bread. Yum! That gave the the idea of making all sorts of apple breads (more recipes to come). My first thought was Apple Cinnamon Rolls with Caramel Frosting. I told my husband, mom, and Leesh about it. And I really couldn't think about anything else. When I have an idea or a food craving like this, my mind won't quit til I get a taste! It was a good taste! 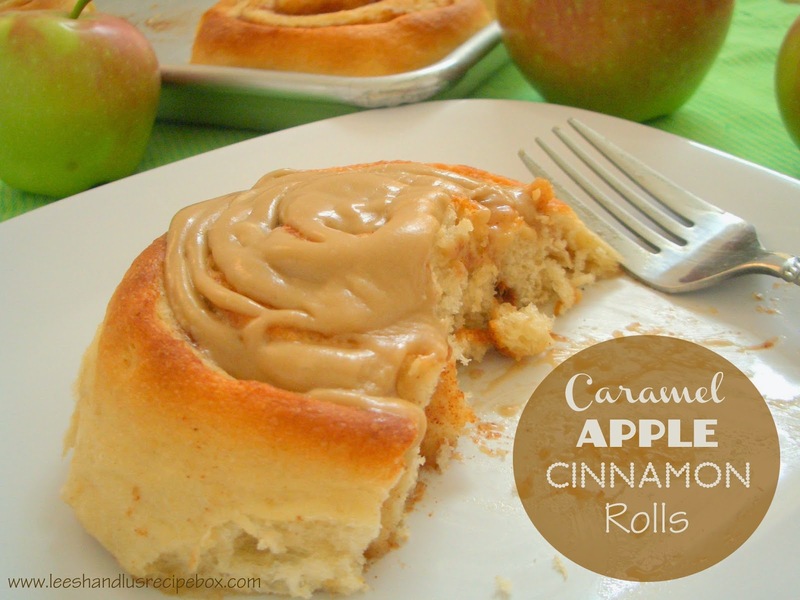 These Caramel Apple Cinnamon Rolls really were like a dream come true. They tasted just how I was imagining them. I made them two ways. I fill half of the dough with Apple Butter, something my mom suggested. And half with cooked diced apples. They both turned out great! I liked them both a lot, but if I had to choose I'd pick the one with the chunks of apple. I like chunks better in something like this. I used the same soft tender dough recipe that I do for my Original Cinnamon Rolls. The dough is perfect for cinnamon rolls, it's so soft and tender. 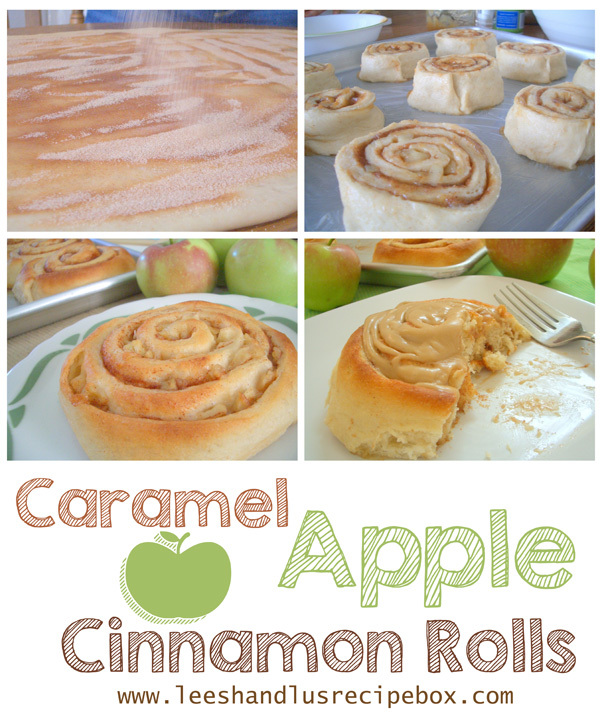 I then and added the apples/apple butter, cinnamon sugar, and topped it off with some caramel frosting. We shared these with some of our friends, and the reviews were great from everyone. I can't say I'll only make Caramel Apple Cinnamon Rolls, because well, I really just love a good old Original Cinnamon Roll too. But these were perfect for Fall, and gave me another way to put to use all those apples that are STILL coming from our tree out back! Yum, yum! I hope you enjoy! Is your mouth watering yet? Mine is! And I'd love to hear from you. What you think of the recipe, and how you like it! Thanks! Prepare cooked apples and cinnamon sugar mixture while it rises. For apples dice 3 cups finely and cook in a saucepan with 2 tablespoons butter stirring occasionally until apples are soft and most of the moisture has cooked out. They will be damp, but not soggy/wet. You want them fairly dry so the dough will cook through as they bake. Mix cinnamon and sugar in a small bowl until combined. You can also prepare the frosting while the dough finishes rising. To make frosting, melt butter in a medium size saucepan, add brown sugar and boil 1 minute. Remove from heat; and add the salt and soda; stir the mixture to combine. The soda makes it expand and rise, so make sure your pan isn’t too small. Add powdered sugar and milk and whip with a hand mixer until smooth and fluffy. Add more milk if you’d like the frosting more runny and add more powdered sugar to thicken it to the desired consistency. After the dough finished rising, punch it down and roll into a rectangle shape (about the size of a large baking sheet). It should be about ¼ inch thick. Leaving about ½ inch uncovered on one of the long edges (so you can easily pinch the seam closed), spread with butter and then sprinkle the cinnamon sugar and cooked apples. Or use the butter and apple butter if you prefer. Roll tightly and pinch the seam shut. Cut into 1 ½ inch slices and place on a greased cookie sheet 11x17. Press them down slightly and let rise until doubled again, about one hour. Here are a few pinterest friendly images for you to save these with. Wow!!!! Look at you inventing such delicious recipes! These look divine and your pictures are gorgeous! Since I've overcome my fear of bread making (with your help!) I'm going to give these a try. Marie, you'll have to let me know how you like them! I'm glad you have overcome your fear of bread making! Homemade bread is too yummy to live without! Miss you!